Motion blur is seen in gameplay, as well as in replay mode. For example, when a player is being flipped, motion blur will show the core of that player as stationary, while the arms, feet and other extremities are spun, giving the user a spinning blur effect. In game graphics have been upgraded to show off the depth of field, unbelievable HDR lighting, shadows, reflections and more. Lighting from players that go from the shadows to the sun, will be dynamic. On-field art has been updated with sharper images. We were shown the same side of the field from a 4:15 game time start in Jacksonville. 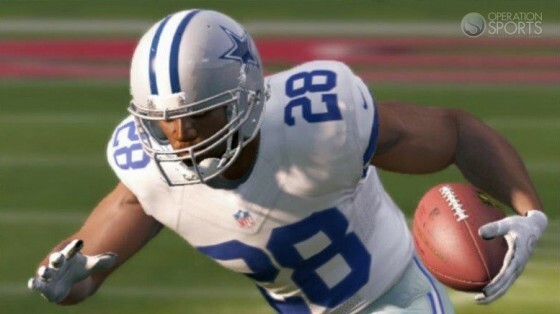 Comparing both Madden NFL 12 and Madden NFL 13 was like apples and oranges. In Madden 12, the screen looked dark and washed out, whileMadden 13 showed great lighting and vibrant colors, making it much easier to see. Multiple light sources will hit everything, with the new multi-vector lighting. It uses multiple angles of light to cast on the players and environment, taking full advantage of night games. The game features a progressive sky, occurring play-by-play. The sun descends, throughout the course of a game, clouds will move, (we cannot see cloud shadows on field), lights will turn on and gradually get brighter as dusk falls into night. All of this, during gameplay, not in between quarters. As seen in some of the early released screenshots, Nike uniforms feature the new padding added to jerseys. Including the new collar and mesh down each players legs. New stitch lines in the shoulder, mesh belly and many more details are included. All team jerseys and all team alternates will be available on the disc. A few might be locked until they are revealed by the NFL. Madden is gorgeous. The NCAA Football series has a screenshot tool, to show off how good it looks. 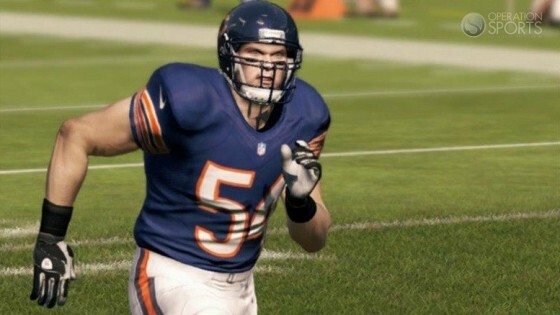 Unfortunately, as great as Madden NFL 13 looks, it will again be without this feature. The team stated that the mantra was to touch every pixel, if you go that far, why not show it off? Give us the ability to capture screenshots, like NCAA Football does. Color me disappointed. The replay system received a massive overall. It now uses a new wire camera, shot from multiple angles and speeds. The replay system will show the impact of a given play, from different players and angles, depending on the situation and outcome of a play. There are over 200 new cut scenes, including pre-game warm-ups, locker rooms, tunnels and more. 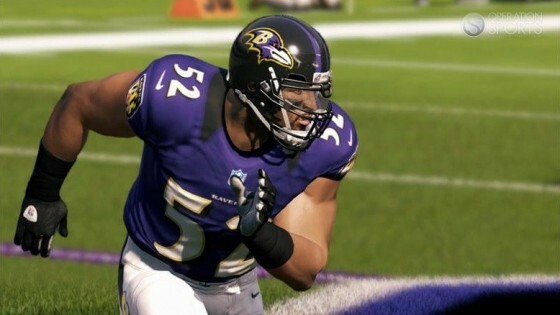 To keep visuals fresh, EA added 650 more new NFL films virtual cameras, for more authentic cut scenes. Many new montages have been added as well. As mentioned earlier, a new and improved broadcast crew will be featured in Madden NFL 13. No more Gus “Run from the cop speed” Johnson and Chris “Where is the mute button” Collinsworthless. Nantz will provide the play-by-play and teams up with his CBS sidekick, Simms, providing the analysis. Together, they have effectively cut dead air from the game. In checking out a preview, Nantz and Simms were flawless. Nantz opens with “Candlestick Park, a stadium that has housed numerous championship teams, plays host to a matchup between the Arizona Cardinals and the San Francisco 49ers.” He then leads into his standard “Hello friends” intro, as he talks about how the intensity is ratcheted up in a divisional game, then brings Phil Simms into the conversation. Simms chimes in with his analysis, talking about how different it is and how both teams are fired up. They both talk about the respect the coaches have for each other. Then Nantz wraps it up, as they head to the field for kickoff. There were no dead spots, no oddly timed pauses, or changed pitches in audio. NOTHING. Everything sounded fluid, like a true broadcast. Jim and Phil are aware of everything going on in the season. This means they are aware of the placement of your team in the playoff race. They will take note of the type of game you are currently playing, whether it’s a must win game, primetime Monday nighter, a Conference round playoff matchup or the Super Bowl. They will talk throughout the game, banter back and forth and have a memory, to touch back on things that were already discussed. As most of you know, whenever Nantz and Simms are on camera, they have a reserved broadcast booth, with a window behind them. Every NFL stadium has its own unique visual. To get the right visual from each reserved broadcast window, the team analyzed the booth from every NFL stadium, to get it as authentic as possible and make it look like you were watching a real life television broadcast. On a good note, Nantz and Simms will comment about the half time and end of game stats. Unfortunately, there isn’t any sort of halftime show. Due to the embargo, I cannot talk about how the two sounded during gameplay, until the Audio playbook is revealed on May 14.